Trump Continues to Berate Fed; Must-Hear Guest: Stephen Leeb Predicts 3-Digit Silver and 5 Digit Gold?! 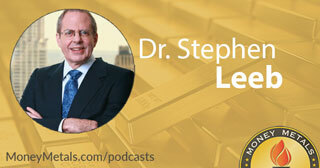 Must-Hear Encore: Stephen Leeb Predicts 3-Digit Silver and 5 Digit Gold?! Coming up we’ll hear a replay of the fabulous interview we did earlier this fall with Dr. Stephen Leeb of Leeb Capital Management. Dr. Leeb weighs in on what he believes will be a major fly in the ointment for the U.S. when it comes to the trade war with China and also tells us if he’s still holding onto the thought that we’ll see triple digit silver prices sometime during the next decade. Don’t miss a wonderful conversation with the great Stephen Leeb, coming up after this week’s market update. Well, it’s the that time of year – when bellies get stuffed, traders on the wrong side of volatile markets get stiffed, gold prices get suppressed, “too big to fail” bankers give thanks for their government-protected profits, shoppers flock to stores in search of gifts to buy with money they don’t have, and Wall Street looks forward to a possible Santa Claus rally…even as the Federal Reserve seems intent on playing the Grinch. The Fed may well hike interest rates again next month. Even as the stock market gyrates into correction territory. Even as a softening housing market raises red flags. Even as crude oil prices fall off a cliff. Even as President Donald Trump continues to publicly berate the central bank. CNBC Reporter: The president was getting on board Marine One in order to depart to Florida for the Thanksgiving holiday, but he stopped to talk to reporters. He went on to talk about the Fed and what he sees as a key problem for the market here. Here's what he said. Pres. Trump: I'd like to see the Fed with a lower interest rate. I think the rate’s too high. I think we have much more of a Fed problem than we have a problem with anyone else. Just about all markets have been struggling with a “Fed problem” in recent weeks – whether it’s stocks, bonds, commodities, precious metals, or even cryptocurrencies. Bitcoin has lost over $2,000 in value in the last two weeks of trading. Bitcoin isn’t necessarily an indicator of any trends in the real economy, but to some extent it does reflect investor appetite for speculation. Bitcoin became the hottest speculative asset on the planet during its parabolic rise to over $19,000 last year. With the digital token now trading at less than $5,000, some holders say it’s a good value. However, detractors warn the bubble has burst with no floor in sight. Unlike cryptocurrencies, hard currencies in the form of gold and silver haven’t been the object of major speculative buying – at least not in recent years. And while the stock market is only beginning to lose some of its frothy excesses in the indexes, there is no froth in metals markets right now. That gives buyers the opportunity to obtain great value with low spot prices and low premiums on common bullion products. Gold prices closed ahead of the Thanksgiving holiday at $1,227 per ounce. Silver, meanwhile, closed on the COMEX on Wednesday at $14.50. The markets are trading on Friday however, so those are not weekly closing prices, but rather as of this Wednesday afternoon recording. Chart watchers are eying the $14.75 to $15.00 resistance zone in silver futures. A breakout through those levels could launch the silver market much higher. For now, though, silver remains a bargain hunter’s delight. It is not only cheap in terms of dollars, but also in terms of gold. For the price of a single ounce of gold, you can buy 85 ounces of silver. Most metals investors who know something of the history of the gold:silver ratio would rather own 85 ounces of silver than a single ounce of gold. Only once in a generation does silver trade at this big of a discount to its pricier counterpart. Silver coins and silver bells go hand in hand. As the holiday shopping season kicks off, we hope you’ll consider some of the many ways to give the gift of sound money to loved ones. Money Metals Exchange stocks bullion for all budgets – from copper rounds that can be stuffed into stockings to pure 24-karat gold for that special someone. If you’re looking for affordable bullion gifts that come ready to give, you’ll want to order a handful of our holiday-enhanced Silver Eagles. We are pleased to offer the world's most popular silver coin – the American Eagle – packaged in our exclusive "Merry Christmas" capsule. This gleaming pure silver coin is a great alternative to cash, gift cards, or other run-of-the mill presents. But the truth is, precious metal in any form is virtually guaranteed to bring bigger smiles to people’s faces than the equivalent value represented in paper or plastic. There is nothing like the timeless beauty and tangible weight of a bullion product. It leaves a lasting memory. The gift of precious metal can be cherished for years or even decades to come. It can help teach children about the value of money, the risks of inflation, and the long-term benefits of saving. Unlike most gifts, any quantity of precious metal stands to become more, not less valuable over time. Well now, without further delay, let’s get right to our interview with Stephen Leeb, originally broadcasted in early October. Mike Gleason: It is my privilege now to welcome in Dr. Stephen Leeb, Chief Investment Officer at Leeb Capital Management. Dr. Leeb has decades of experience in the financial markets and has even authored seven well regarded books, including best sellers The Coming Economic Collapse: How to Thrive When Oil Costs $200 a Barrel, and Game Over: How to Prosper in a Shattered Economy. He's also the Founder of The Leeb Group, which publishes several financial newsletters. Among them, The Complete Investor, a publication that has received two awards for editorial excellence. As such, Dr. Leeb is one of the foremost authorities on macroeconomic trends and commodities, especially when it comes to energy and precious metals, and has appeared on financial shows, on Fox Business, CNN, and several others, and it's great to finally have him here on the Money Metals podcast. Stephen, it's a real honor to speak with you and thanks so much for joining us today. Dr Stephen Leeb: Mike, it's my pleasure. Mike Gleason: Well, Dr. Leeb, I'd like to get your thoughts first on the equity markets, as we're talking here on Wednesday, there's some real fireworks going on, but stocks bottomed in early 2009 with the S&P 500 at 735. We're approaching 10 years of a bull market now, with just a few bumps along the way. I guess the last week being one of those. But the S&P has nearly quadrupled. On the one hand, we can see headwinds for equities building, interest rates are rising, the President's tariffs are likely to disrupt trade and raise costs. Valuations are really stretched relative to earnings with average PE ratios at extreme highs, and this bull market and stocks is awfully long in the tooth as we both know. On the other hand, there are some legitimate reasons for optimism. We've seen reduced taxes and some reduced regulation with hope for more of that to come, so what are you expecting for stock markets? Do you think we can get another year or two of rising prices? Dr Stephen Leeb: I would say not two. I would say at most, into 2019. I think after that, we start really having problems. One of the reasons that you have events like today, I mean, the market's down, wow, I'm looking at this trying to figure out exactly how much it's down. The S&P is approaching 4% decline. That's a very big one day decline. I don't remember the last time we had one like that, and it follows about four declines in a row. The reasons here I think are basically investors really don't know what to expect. I mean, you did lay out all the reasons for why the market has been rallying, and rallying recently on the heels of the tax cut. More money in company coffers, et cetera. But there's a payback and part of that payback is going to be a whole lot of debt. Part of that payback is going to be, as the IMF said yesterday, lower growth. Especially going into 2019. Really, across the board. That's going to make the debt problem in the U.S., I think a very, very serious problem. Where are we going to get the money? The administration now is talking about an infrastructure program. I don't see it. You see these strange things coming out of the administration. I'm not taking a political side, I don't think this is a political issue, because these strange things, they go across administrations. It's not just this administration where you see strange things coming out. It was the previous administration, and probably the administration before that, so I mean, this is not a pox on Democrats or Republicans. This is a reason why we should not be so partisan, though, I guess. Dr Stephen Leeb: The Pentagon issued what they might call a whitepaper the other day, telling us how dependent we are on China for certain critical materials. In particular, heavy rare earth, which are really essential for many of our technologies and especially important is that they're essential for our military technologies. The only real source of those heavy rare earths are China. Well, let me just qualify that. There is a company domiciled in Australia, called Lycas, and they do have a huge ore body of rare earths, including heavy rare earths, but they have to send them to Malaysia in order to be refined. Because it's a very, very elaborate process, and recently the Malaysian government has been making noises, very strong noises that they may shut down that refinery. That would leave the world essentially dependent on China for what are really essential chemicals and elements for our high defense, our high technology products. And that's not a great situation to be in. But what is really upsetting to me is that this is something I wrote about in 2011, in my book Red Alert. I'm doing another book on China right now, and it's not going to be as optimistic as that. I mean, I thought we would catch up by this point, and when I wrote about it in 2011, let me be clear, I don't want to take credit for being the first to realize how important rare earths were. I mean, it was known then, so there's probably a decade of unwillingness to address this very, very serious problem. And then you see Vice President Pence giving a speech I think within the last week or so, saying that we're going to go into the South China Sea, we're going to make a scene, exercises there. We're in no position to be able to handicap those kinds of exercises, because it's not clear that we have the kinds of technologies that we need. I hate to say this. I mean, if we were fighting a world war against China, yes, I would give heavy odds that the U.S. would win. We have a much bigger military presence throughout the world, but China has not really geared itself to fighting a world war. They've geared themselves to defending critical territories. And they've used these technologies. I can cite chapter and verse from people that are in our own armies, our Air Force, our Navy, our Army, and that have done this research. They're paid researchers. This was from circa two years ago. China's progress in these areas have been startling, while we've been hung up in our own bureaucracies. This was pre-Trump, so it was maybe three years ago, three or four years ago. We still haven't done a thing about it, and I think this is probably about the third or fourth whitepaper that I've seen on rare earths, and then you have, and this I do have to say, I don't want to take a political stand here because it's a pox on everybody. But when you hear the president saying that all these tariffs are going to mean tremendous taxes paid by China into U.S. coffers, well, that's not how tariffs work. It's the U.S. that are paying the taxes, so that they won't buy the Chinese products. There seems to be a lot of disconnection within administrations over what America needs, and this has led me to really think that we probably need a new monetary system, a way for the world to cooperate and come together. We're just not getting there, and if you're not going to get there, it's going to continue to be rough and ready. Most countries have stuff that other countries need. I think China has been first to recognize this, and they've done a pretty good job becoming independent, but they're not completely independent. I mean, they have their own issues. We have our own issues. We're just going about this the wrong way. I mean, this is probably the worst time to be as partisan as we are. You just saw this with this debate over the Supreme Court. Who can say who's right? It's a question of are you Democratic, are you Republican? I mean, it was to me, a little bit horrifying to watch what was going on. Supreme Court nominees are not, they don't get in by one vote and that one vote being based upon what party you're from. I mean, something has to change or else I fear that it could get worse, and just giving you my feeling that I talk the talk, but I'm also walking the walk in that I'm writing a book that basically will have to do with China, and gold. I don't see how you can continue with the kind of situation that you have right now. I think China at this point is doing as much trading, apart from the dollar, as they possibly can. Will that speed up? I would guess it would. So, you're in a very unique, historical situation right now, and it covers all sorts of areas. The center point I would probably say would be oil. I mean, what I was talking about earlier, rare earths, that's certainly a very, very important boldface sidebar, in this whole discussion. But we've got to come to some sort of agreement and this stuff with tariffs, I understand it. I understand that China's done a lot of horrible things, but I think that they will listen to reason. China from my point of view, I've studied them, they're not a bellicose country, basically. I mean, the last war they fought, I don't know when the last war they fought, but they've fought a lot fewer wars than we have, and they lost wars. I think that's something that really informs what they're doing. They don't want to lose another war. They're not seeking worldwide hegemony, they don't have a military that can challenge us across the globe, but they do I think have a military that can well defend the areas that they consider critical to their survival and that's most of the developing world. I mean, we've got to try and work this out with them, or else we're going to see a lot more days and a lot more volatility in this market. I think we had a lot of good times, a lot of it was due to the fact that commodity prices dipped and fell, and you had a tax cut more recently, but now it's going to get a little bit harder. Now you're seeing all of a sudden, costs rising, and things like that. I think we have our work cut out for us, and I think that every investor probably should own some gold. Mike Gleason: Talking about gold here, Stephen, it seems to us that it's actually doing pretty well. I know a lot of people are probably pretty disappointed by the price action, but given how well the stock market has done, prior to this week of course, and how strong the dollar has been in the currency markets, you've got to feel pretty good about how gold has hung in there, don't you? Dr Stephen Leeb: Yes and no. Yes, you do, but what you have to realize Mike, if you took a chart of the gold priced in yuan, you would see it looking not quite a straight line. If you took a 200-day moving average, it would be pretty close to a straight line. A 52-week moving average. Over the last 12 months, see this is I think part of China's plan, gold and the yuan have traded very, very close together. Very, very close together. I think what China is trying to say, and I'm not necessarily accusing them on manipulation or anything like that. I'm not really a conspirator, but as I said, I think back when you first started asking me questions, that if you're in China, and you have yuan, you can trade your yuan for gold. And if you have gold, you can get yuan for gold, you can get gold for yuan. If you're trading oil, you can do that. Now, it's not an easy thing to do. I mean, you have to go over to another pit. I don't know what it's involved. I've never really traded commodities on that level. I trade them on the phone, I'm not in the pits et cetera, I have no idea, but I do know that de facto yuan and gold are exchangeable, and oil trading in yuan is oil trading in yuan, de facto backed by gold. So what the Chinese arbitrage or whatever it is, what's happened is if you look at gold priced in yuan, it's been very, very steady for the past I would say over a year. At least since they started trading that oil contract. I think China's message to the rest of the world is that the yuan is as good as gold. That doesn't mean it's as good as the dollar. It has not been as good as the dollar, but it has been as good as gold. My guess is that gold, here we're talking about a hypothetical, I honestly think gold would probably be higher, had this yuan/gold effect not been in place. I mean, I think there's enough uncertainties in the market right now, in the economy right now. There's a lot of people that are not happy with Trump, profoundly not happy, and there are a lot of people that are profoundly happy. I come from a family where I'm scared to talk to my son and I'm scared to talk to my wife. When I talk to my wife, I have to say one thing, when I talk to my son I have to say something else, or else I'll be an orphan. I'll be thrown out. People have very, very strong emotions right now, and I just wish I could bring people together. But there are these kinds of partisan uncertainties. Can you ever remember a time where you had a partisan division deciding the Supreme Court nominee? I do think Kavanaugh's a perfectly acceptable nominee, but the way he got in by appealing to partisanship. I mean, this is nuts. I think that gold probably would have been stronger, that's just my guess. This is highly speculative, had it not been for the fact that it's now linked to the yuan. Now, there's a good reason for the yuan to be weak, because we're administrating these massive tariffs, so that by weakening the yuan and the dollar staying relatively strong, at least gives China time to transition from exporting to the U.S., to exporting to the developing world in the East. One thing with is true is that China's trade with the Belt Road Initiative right now is something like 1.6 trillion dollars a year. Much, much more than the U.S. I think China's goal would probably be lessen their dependence on the U.S. Our goal should probably keep them dependent on the U.S., so that it's easier to create a world war, but you do have these blasts of uncertainty coming forward. And how is the high debt going to affect us next year? Et cetera. So, I would have expected gold, everything else equal, to be higher, closer to $1,300-$1400. But look, that's not an argument anyone can win. If you tell me you think it's good around $1,200, I'm not going to get into any sort of debate about that. But I do know that if you look at the yuan and you look at gold, they've been basically straight lined. I mean, it's ironic, because if you look at the yuan by itself, it's been incredibly volatile, and if you look at gold by itself, it's always pretty volatile. But if you look at them together, to have their volatility so matched together, it is really a very, very, very low probability, statistical phenomena, so low that you just have to guess that they are somehow interlinked. But again, I don't have proof of this, and I don't want to raise the thought of conspiracy or anything like that, because it could be happening very naturally, because of the arbitrage with oil and gold, vis-a-vis the yuan. So, yes, I think that gold is holding up with respect to the dollar pretty well, but I think that it probably could do better. There have been a number of periods in history in which gold has done very well in the face of a strong dollar. Typically, if the dollar gets crushed, it means that something's gone wrong in the U.S., which for most of our lifetimes has been the strongest economy in the world, so it stands to reason that gold would rise. But there have also been times where the dollar has done well, the U.S. has done well, and there's been inflationary pressures, and gold has done well, too. So, I think gold is acting according to a different dynamic at this point. Mike Gleason: Well, we've touched on gold a little bit there. How about silver, Stephen? We've got a ratio of 83:1 as we're talking here on Wednesday afternoon. What kind of value do you see in silver in the months ahead? Because silver can be a very interesting metal. It's got this push/pull situation going on. Sometimes it's hurt by lack of industrial demand during a slowing economy, but it can also catch a bid during such an environment due to its monetary status as a safe haven. So, what do you have to say about silver here as we begin to close? Dr Stephen Leeb: I think silver could be, and again, if you'd asked me this a couple of years ago, I would have said it could be a $100 metal. I haven't changed. I think that silver basically for reasons that you put so well, and it's an industrial metal, it's also a monetary metal, and its industrial uses I think in some cases are probably not replaceable. Right now we need it for photovoltaics, and I think that has to play a major role in future energies. It's the most conductive metal on the earth, it's more conductive than copper so it has a major role in all of these car information systems, because you need incredibly good conduction in certain cases. Its industrial uses are starting to really expand, and as you see the electric vehicle take off, I think you'll see a greater demand for silver. It's more volatile than gold. I mean, if you find your stomach turning watching gold, which sometimes I do, don't watch silver. I mean, then you'll have to knock yourself out with Valium or something. I mean, it can be really a crazy metal, but if I were a betting man, I would say in the early 2020s, it would not surprise me —I don't want to make a prediction – but it would not surprise me to see three-digit silver. It would not surprise me, incidentally, to see five digit gold, because you're going to need a high price of gold in order to back up a lot of the trade that I think you're going to see in this world. I just again want to emphasize, in writing this book, I started talking to my editor et cetera, I said, "I don't want the last chapter to be a doomsday chapter about the U.S. I want it to be a hopeful chapter that this still can be a win/win situation." There doesn't have to be a number one country in the world. I mean, there has to be a number one world, a world that can be united and share and do things. I mean, everybody has things that everybody else needs. I don't want to sound like an idealist, or some sort of spiritual nut, I'm not by any stretch of the imagination. But I think if you look around and see, the world was doing okay for a while, but we lost it here when everything speeded up for us after we went off the gold standard in the early '70s. We went from a country that looked forward and invested for what was going to happen in the future, to a country that is now trading in terms of nanoseconds. We've got to get back to the Bell Lab days. I mean, we criticized the hell out of China because of these state owned enterprises, which I think is probably right to a certain extent. But I'll just cite one state owned enterprise, or state controlled enterprise that we have in this country, and it's called AT&T. This is before the breakup and everything else. It was when AT&T controlled Bell Labs, and it was basically a government run utility that was allowed a certain rate of return. But they were also allowed Bell Labs, and out of Bell Labs, we got our transistor, we got laser, we got the internet, we got so much out of that. We have to get back to what really made us successful. In 1957, Sputnik was launched, and three years later, instead of battling Russia, which we were to some extent, but our major focus, our major reaction to Sputnik was what? It was multibillion in today's dollars, grants for science, education, and everything else, to get us going on. Now you've got this thing with rare earths, there's a massive deposit of rare earths in Canada which could be developed. But we've done nothing about it. It's been a decade, and we've done nothing about it. Incidentally, I'm not saying this to brag, about seven years ago when my last book came out, Steve Bannon did a half hour interview with me, talking about rare earths. The only reason I'm saying that is because this has been known. I was not the first one to discover it. But maybe the first one to write about it in a book. There are so many good things that we could be doing. There are Manhattan Projects around, like rare earths would be one example. But there are others that we could be using to develop not a hydrogen bomb, but rather things that could help our technologies, help our well-being, and help the wellbeing of a lot of other people. We've got to get the right religion, we've got to all become Americans. I'll be happy when someone says to a typical person, "What's your political persuasion?" If that person says American, he has my vote, or she has my vote. But until we get to that point, I fear you're going to have a tremendous amount of volatility. Market's now down 3%, incidentally. I had the numbers wrong before, but now unfortunately, I have 'em right, and it is down about 3%, the S&P. Maybe a shade less. And I don't think that this is the big one yet. Could be wrong. I think it's a time to be cautious. Incidentally, if I can make one correction, I don't publish these services anymore. They're published by an outfit called Investor Daily, out of Virginia. They do a very, very good job and I want to make sure they get credit for it. I'm the editor. Everything that goes into my publications is me. It's me, my wife, and other people that help me, but I do manage money. That is true. But lately, in the publications we've been getting more cautious. Now, of course, I look at it day like today and I say, "Why didn’t I get even more cautious." But anyway, I would stay cautious right now. I don't think I would make a big bet that this is the start of a massive decline, unless we see something show up, some big bank in trouble et cetera, then you know that you've got to act very, very quickly. I don't even think gold would be the best way to act right then. I think it would probably be zero coupon bonds. That's what worked better for us in 2008, and then you saw gold shoot up. But yes, I think everybody should have gold in their portfolio, at least up to 10%. Silver, as a portion of that, precious metal division, which could again be run up to 15%, and be cautious. Look at value stocks. They tend to do better in situations like this. That would be my general advice. I do think that we'll probably get a recovery. New highs in January, it wouldn't shock me. But it wouldn't shock me if the market continued to go down. I mean, these are turbulent times. And in turbulent times, things that are unpredictable sometimes happen. When you're in a situation where you have almost no excess oil supply, you could get a spike in oil. Even from the $82 area, and that would be really very, very serious. Oil spikes have proceeded every major market correction, and I think every major economic decline since the Arab embargo in the early '70s. One thing to keep your eye on is not necessarily $100 oil, but if you saw oil find a home above $100 for let's say a month or so, I would really get super cautious. That would be one sure sign that things are really out of whack. I think times are going to be very turbulent. You've got to stick with gold, you've got to stay on your toes, and you've got to take very much for granted. Mike Gleason: Yeah, well that's very well put, we'll leave it there for now, and thank you so much for joining us, Dr. Leeb. We hope we can do this again in the future. We've been following you for quite some time and really value your insights. It was great having you on. Before we let you go, please tell people how they can find you and follow you if they'd like to do that. Dr Stephen Leeb: Okay, sure. Basically, you can just look me up on the internet, Stephen Leeb. And the place that publishes my publications right now is called Investor Daily. It's right there. There's a Wikipedia thing on me, which is actually pretty true I think. And I would look up Investors Daily. I do two or three publications for them. They'd be happy to have you. They'll also try and sell you other publications, and those other publications I'm happy to say are very good as well. They do a very good job, so I think that would be the easiest way, instead of giving you a long internet address. Just Stephen Leeb, just Google that and you'll come across a number of hits. Some of them will say good things about me, some of them will say not so good things about me, but there will be at least one of those things that says Investors Daily, and that's the one I would hit, and I think they'll give you free introductory offers. I got out of the publishing business, because it was just too much doing analysis and publishing. I'm a better analyst than I am a businessman, which is not to say I'm a great analyst, but I'm much better at that than I am at running a business. They do the business stuff and that's what I would look like, Investors Daily.